Not to be confused with the vastly-different Baseball Stars II on the Neo-Geo, this NES title is the lesser-known follow up to one of the greatest baseball games known to humankind. As was the case with a lot of great NES games, Baseball Stars II didn’t get a lot of ink back in its day, having been released well after the 16-bit wars had started. Back in 1992, you could have been playing an inferior game on the Genesis like Tommy Lasorda’s Baseball with admittedly better graphics and sound, or you could have been playing this this awesome game. To me, a baseball game should be simple, and shouldn’t really need analog sticks or 8 buttons to play. Maybe I’m just a retro-grouch, but I think that sports games really hit their zenith during the 16-bit era. Since then, they’ve just become overly complicated and a hassle to play. The beauty of Baseball Stars II is that it improves upon the original while leaving the core game play intact, although admittedly these improvements are minor and may not be worth the outlay of extra cash to the casual gamer. 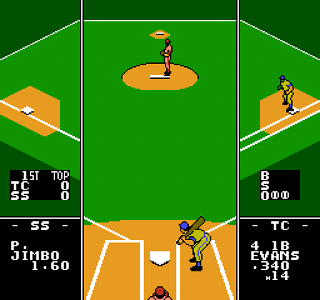 Graphical improvements include more realistic-looking characters, and a split-screen displaying both first and third base. The colors have also been altered in a way that makes the game look more vibrant. Like its older brother, Baseball Stars II has a league mode, complete with battery back-up, that allows you to play through a season with your choice of length, although it’s still devoid of playoffs. You can also now choose which stadium you’d like to play in, which isn’t a huge deal but is a nice touch. There are a couple of things missing in this game though. Gone are the unique teams like the Ghastly Monsters and American Dreams, and the create-a-team option has been pared-down slightly. The maximum length of a season has also been reduced significantly. None of these negative changes really affect the way I play the game though, so that there is a small net improvement over the original game. Honestly though, they’re both so good as to stand head-and-shoulders above every other baseball game on the NES. Buy Baseball Stars II on GameGavel or Amazon. Tagged Baseball, Baseball Stars 2, Baseball Stars II, NES, Nintendo, Review, Romstar, SNK, Sports. Bookmark the permalink.